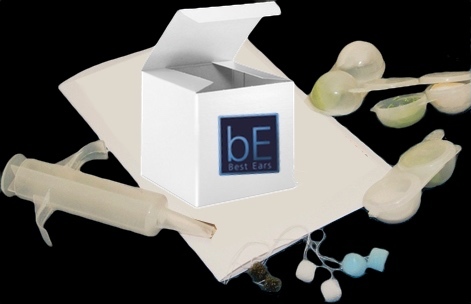 High quality ear impressions are perhaps the most important thing needed to make your Best Ears Custom In-Ear Monitors fit and sound their best. The impression is only the first step in the process of making a custom mold. These impressions are used to make a finished earmold. Impression Kits are $5 off if purchased with a product such as the In-Ear Monitors or the Custom 2-Way Radio Earpiece. A proper impression allows us to guarantee fit and comfort. An impression is a copy of the inside and helix areas of your ear. The earpiece(s) you receive will be an exact fit to the shape of your ear. The impression is made by first blocking your ear canal with a foam block. 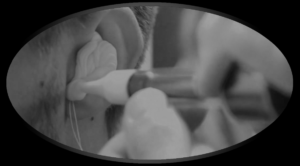 Next, a quick drying, non-sticking, hypo-allergenic, medical grade material is injected into the ear. After 5-8 minutes drying time, the impression is removed from your ear. The process is safe and painless. If you are local to the Asheville area you can contact me and arrange free ear impressions, which I will do personally. I have been trained by a professional Audiologist to safely take deep ear impressions. If you are not local (or willing to travel) to the Asheville area, you have other options. It is recommended to find an audiologist in your area to take the impressions for you, but this can be costly.. between $25-85 per ear. Impression material for three impressions (one extra). Remember: you do not need to do anything other than take the impressions. Please do not trim/cut anything, remove the ear dams, or alter your impression in any other way… we’ll handle everything else!